Giving back to the communities that we do business in and beyond is an important part of the values we promote at StaxUP Storage. So much so that you can find many of our self storage professionals not only passionately fundraising for charities in their area, but also volunteering on their days off. 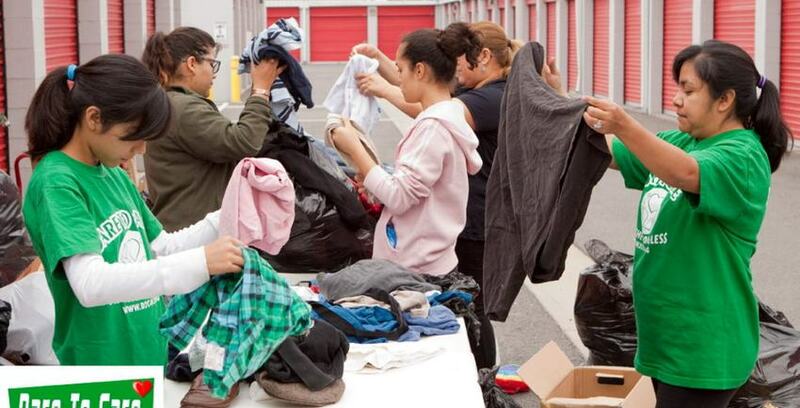 At South Street Self Storage, assistant manager Kassie Reyna is helping put on a spring drive for the non-profit organization Dare to Care for the Homeless. The drive aims to collect any and all items such as non-perishable food, household goods, and clothing. “When people are moving and have bags of clothes or homegoods that they want to throw away, we tell them that we work with a non-profit organization and they are able to donate those things to that organization,” Kassie said. The team is also collecting health-conscious food items for a local women’s shelter where Kassie volunteers. She says that she’s volunteered her time there on and off for the past three years alongside her manager, Tony, and former manager, Sandra. The shelter is home to around 40 women and 20 children. The board meetings take place at South Street once a month on Monday nights. Kassie says that their most recent gathering cooked up a new fundraiser for Dare to Care for the Homeless and is happening now. It’s apparent that the team at South Street Self Storage is pretty busy managing its philanthropic goals; between the Jamba Juice fundraiser, the homegoods drive for Dare to Care for the Homeless, and the healthy food drive for the women’s shelter. You would think that it might become difficult to keep it up on top of volunteering on the weekends. However, Kassie says she stays motivated because of her own life experiences. “I’ve been in a situation before, so it’s just nice to give back,” Kassie said. The dedication that Kassie and the South Street Self Storage team show every day is remarkable, and we know they will continue to be a shining example of what it means to be a good corporate citizen in the Long Beach community!